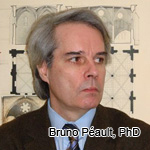 Regenerative Medicine Today welcomes Bruno Péault, PhD. Dr. Péault is Professor and Chair at the University of Edinburgh, Center for Vascular Science, and Professor of Orthopaedic Surgery at UCLA. Dr. Péault discusses the use of stem cells in research and how far our knowledge of stem cells have come. For more information about Dr. Peault, click here.